Welcome to Finland's friendliest cricket club! Everything you need to know about Empire! At Empire Cricket Club we are committed to giving anyone who is interested in the game the opportunity and desire to play, compete, and enjoy the sport. We always have played and always will play our cricket in the true spirit in which it was intended to be played. We respect the Umpires' decisions in all matters, we welcome our opponents onto the pitch, applaud them, and we always show respect towards them, the officials and each other. We do play hard, but WE PLAY FAIR. As guiding principles we organise and manage our club in order to encourage and support our junior recruitment and development aims as far as possible, while at the same time endeavouring to maintain a high level of cultural diversity by continually attracting members from all possible ethnic backgrounds. The mixing of so many cultures is one of the great benefits of cricket and at Empire we have the most culturally diverse club in Finland. With members hailing from Finland, England, the Caribbean, Germany, India, Holland, Nepal, Bangladesh, Pakistan, Australia, and Sri Lanka, we are the only club in the country that could field a team with eleven different nationalities in the line-up. We play cricket first and foremost to have fun, and will seek to make all our fixtures family occasions as far as possible. Of course we aim to develop a competitive and successful team but never at the expense of the higher principles outlined above. Success on the field is desirable, sought after, and gives purpose to competition, but winning is not everything. With the snow finally melting in these parts, it is time for the cricket season to finally get started. Empire has planned a busy summer having entered in three competitions, the SM40 competition, the T20's and Developmental division with the usual number of friendlies. Go to matches page for all our fixtures. On April 2012, Empire once again kick off the summer season at the traditional indoor tournament in Turku, which Empire won a couple of years back. It was not to be this year though as Empire lost to Shauriya, Tampere and Finnasia, though we were able to save the blushes by beating the hosts. Though we were not able to win the tournament, we all had a fun day and enjoyed some good cricket and a nice day out. Check out the Turku indoor video directed by our Chairman Jo. Apologies to our loyal readers, that it took so long to get the new edition of our monthly newsletter up on the site. Highlights include a breakdown of Empire's 2012 annual general meeting and the winners of 2011 club awards. For the full edition, please click here. Payable direct to club account (Nordea 146930 229324 using your club viite number or in cash to Shaun (Treasurer) or other committee member for Shaun as soon as possible but in any case BEFORE 1 May. Match Fees: Summer Leagues: €5 SM40, €3 T20 for each player at home and away (with exception of out of region matches -Turku, Tampere etc, when match fees will be waived in favour of meeting transport costs). Other matches as per organiser's arrangement. FCA Player's Licence fee will be set at the FCA AGM and members notified in due course (last year it was €25). Players need to pay this themselves when registering with FCA via the SLU website. The SLU's personal injury sports insurance can also be taken out at the same time (recommended) at premium yet to be set (€58 last year). As a registered club we are obliged by law to hold an Annual General Meeting (AGM), which all club members are expected to attend where possible . For new members, the purpose of the AGM is simply to present the club's accounts for the previous year, set a budget for the coming year and formally elect a committee and other posts by which to administer it and manage the club's affairs for 2012. It is important that club members fully participate in this process. AGM Date: 29th January 2012 from 4pm - 6pm (with awards and social until 8pm). Venue: The kerhohuone (meeting room) at Klaavunpolku 2, Helsinki. This is easy to reach and find, right next to Puotila Metro station (south/Puotila side exit) and the adjoining school playground. For more info, access the Empire club Forum. This Saturday, January 14 2012, Empire will kick off training sessions for the new year. Training takes place between 21:00 and 22:30 at Pallomylly. The address is Pikajuoksijankuja 9, 00920 Helsinki. Everyone is welcome to join. The first training session is on the house. 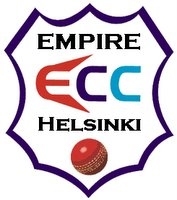 Can't wait until Saturday, well Empire CC will be playing in the indoor league on Friday, January 13 2012 at Merihaan Palloiluhalli starting at 20:00. So come along and enjoy some Finnish cricket. Here it is everyone, the last 'From the Boundary' of a very fun and exciting year with some great news as we welcome a new member to the Empire family. Our member Gavin and his wife Alicia gave birth to their second son on December 5th. Congratulations, Gavin and Alicia. In other news, Empire CC kicked of the 2011 indoor league by beating SKK, but losing to Kerava and Jo was in action again, selling some really delicious cakes during the Helsinki pop-up restaurant day dressed in full Empire CC attire. For the full issue as well as past issues, please follow this LINK. Due to Otaniemi dropping out of the indoor league competition, a complete overhaul of the schedule and format was necessary. Instead of two groups of 6, the competition will now be played with one group of 11 in a round robin league format, with each team playing each other once. Empire still will have two team in the league. For more information, go the indoor league page. Empire 1 opened the indoor season on Friday, winning against SKK by 2 wickets, but losing to Kerava by 22 runs. In total Empire 1 received 15 points. Not too bad of a start to the season, but maybe a bit unluckey, since we were in a good position to win both matches. Match reports to follow soon. Here it is, what is fast becoming a famous publication, Empire monthly newsletter, From the Boundary. This month's highlights include a warm welcome of 5 new members to the Empire family, everything you need to know about Empire's participation in the indoor league and an update on our training progress. The indoor league is once again upon us and this year Empire has opted to enter two teams. The schedules have been announced and a record 12 teams will be participating this year. The tournament will be held at Merihaan Pallohalli with matches being held every Friday starting from December 2 2011 up until the end of April. Go to the Indoor league page in the Matches section for information. Remember everyone, this Saturday October 22nd, our first winter indoor training of the 2011/2012 season is planned at Pallomylly starting at 21:00. Everyone is welcome to try out and join us for some cricket. Go to training page for information. The ICC, yes that ICC (International Cricket Council) in association with the FCA recently released a really interesting video on the development of cricket in Finland. I am sure many of us can empathize with scenes from the video. Watch it Here. Our Mission and Our Values: We play the game according to the true Spirit of Cricket and we always have Fun!